Your donations are deeply appreciated. All donations will be used for promotion, education, and removal of broom. Please contact us if you would like to make a donation by credit card, Paypal or interact. 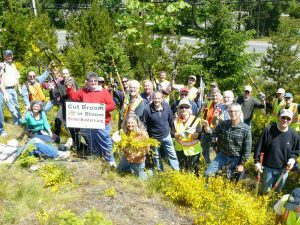 Broombusters Invasive Plant Society is a registered non-profit society in British Columbia, BC, Canada. Our mission is to educate and empower communities to contain the spread of Scotch Broom, anywhere. The name Broombusters and our slogan Cut Broom in Bloom and Cut the Bloomin’ Broom were created by our grassroots group in 2006. We are an umbrella organization working with many communities, for we believe we are more effective when we work together! Please contact us before using our name or slogan. Let’s work together! How to help – Get Involved!